The va'a motu (island canoe) was the highest development of the Tahitian outrigger sailing canoe. At the time of the first European contacts, the golden age of bold voyaging was over, but there were enough remaining artifacts for artists of the time to give us some idea of what their sailing canoes were like. The va'a motu was not the large ocean crossing vessel used for migration but rather the everyday tool used to provide protein from the sea and for commerce between nearby islands. The va'a motu has several interesting characteristics that differentiate it from other canoes in Oceania. The hull is characterized by a low wave piercing bow which is only now being adopted by the most high tech racing multihulls. The other defining feature is the high raised stern. These two features work together well to make it both seaworthy and fast. The high raised stern has been adopted by the many modern replicas of Polynesian voyaging canoes and besides the obvious advantage in a large following sea, it counterbalances the bow and prevents it from diving too deeply under the water. I've found this to be true also with my 6M [20'] hull described in this manual. Light weight modern beach catamarans and early modern multihulls can sometimes be difficult to tack through the eye of the wind without stalling. The most delightful surprise from this va'a motu is that the problem has totally disappeared. It tacks as quick as a little dinghy, with or without the optional jib, and even in steep head seas. 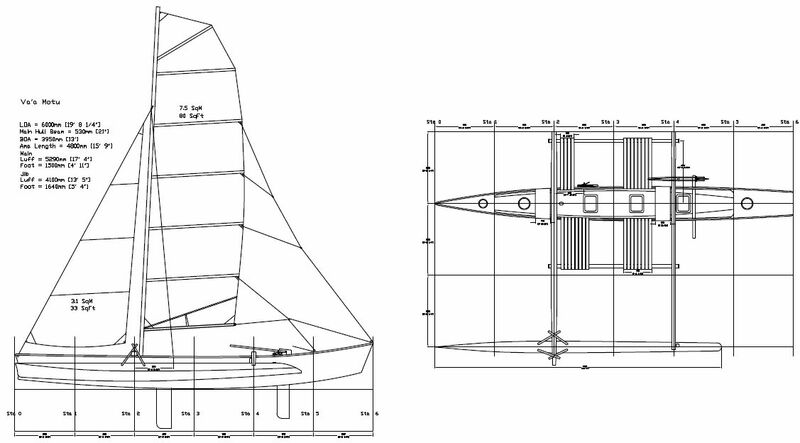 However, all boat design is a bundle of compromises. That high sweeping stern does not contribute to the load carrying capacity when sailing in smooth conditions or at rest. The rocker of the bottom panel in the stern may prevent you from reaching the highest multihull speeds but 12 knots is still easy to attain in the right conditions. The ama also has a low wave piercing shape with a vee deck to shed water and enable it to quickly climb out of a wave. 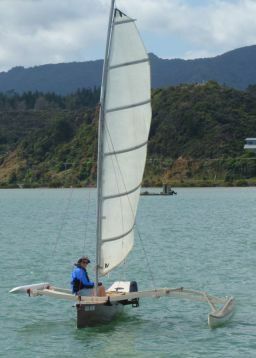 Flat ama decks are fine on larger multihulls where the ama buoyancy can be two to three times the displacement of the entire craft, but with a smaller single or double outrigger where the buoyancy is much less, you want an ama that climbs out of the water as easily as it passes into a wave face. This ama also has sufficient rocker under its stern to enhance its tacking ability. You will see banana shaped amas especially in Hawaii where the ability to land in high surf is most important. For most of the sailing that is done in this size of canoe, a straighter wave piercing ama is faster and will throw less spray back at you at speed. The ama in this manual is built like a foam and fiberglass surfboard with a central web of thin plywood. It is ultimately the safest solution because no matter what the extent of damage, there will still be some buoyancy there to keep your canoe upright. The ancient va'a motu used a large counter balancing beam on the non-ama side to allow crew members to use their weight to prevent the solid log ama from submerging. With modern light and buoyant foam amas it is no longer necessary , but there are hiking seats on both sides and their use does improve performance. 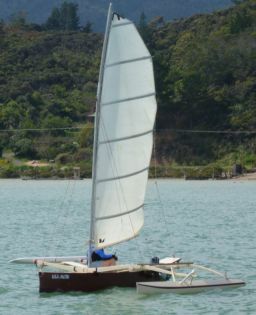 The ancient rig used by the Tahitian va'a motu was a very high aspect ratio vertical sail that with modern materials would still be competitive today. It had a interesting hook at the top that I know was being investigated by a university wind tunnel but I don't know the results. The main disadvantage of the ancient one's rig was that it was like a gigantic windsurf rig. It had to be fully rigged and tipped up or down with no reefing or furling. The performance was good but the practicality was low by modern standards. 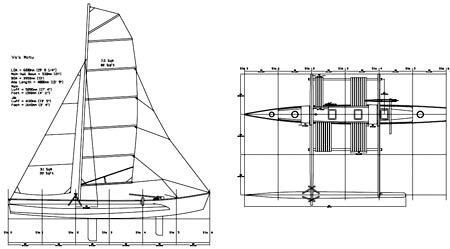 The design in this manual uses a modern high aspect fully battened sail but has an unusual sheeting arrangement. 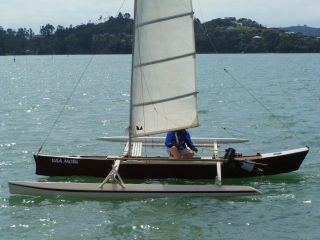 Narrow high aspect sails with a fat head would twist too much without a powerful vang under the boom to pull it down. Both the Chinese with their junks and the Tahitians found a lower stress way to do it. Multiple sheetlets are attached up the leech of the sail at several points to control the twist at the top. This doesn't really work very well if the leech of the sail is almost above the stern of the hull, but in the case of a junk or a va'a motu, the extra length and height of the stern provides a perfect location to anchor the sheet without too much down pull on the leech of the sail. The tension on the sheet (and the pain in your hand) are reduced with this system. A ratchet block on the deck also helps. Reefing is as easy as with a junk rig, just lower the halyard. You can re-hook the downhaul but it's not absolutely necessary. Most Tahitian outriggers still use a crossbeam system where the forward beam is quite stiff and substantial but the aft beam is flexible. This allows for some independent movement of the ama in response to the waves, and has been adopted in different ways in other island designs such as the Marshall islands. The design in this manual uses a smaller section crossbeam aft and you can readily see the effect when sailing. The safety ama is a modern day Hawaiian innovation as the result of racing their sailing canoes through very rough conditions between the islands. It will not completely prevent a capsize but will slow it down to the point where it can usually be avoided. It is also easily removable in the event of a 180 degree capsize so that the canoe can be more easily righted. Everyone's favorite questions. I've been doing this for a long time and I have every tool you could want so that when I build a new prototype, there is little wasted time or motion. This one took about 220 hours to get sailing, including cutting down a bigger sail to make mine. I bought the mast second hand and I would recommend this too as there are many unused centerboard boats and beach catamarans sitting in backyards. Buy the whole thing and you'll have a box full of blocks, cleats, rudders and many more miscellaneous parts that you can use. Don't ask me how much it costs to build because it's almost meaningless considering the many countries where builders live. Just study the materials list and price it out for your location. Nine A1 [33" x 24"] plan sheets. A 46 page construction manual on a CD containing over 150 construction photos. E-mail help from me until your project is completed.